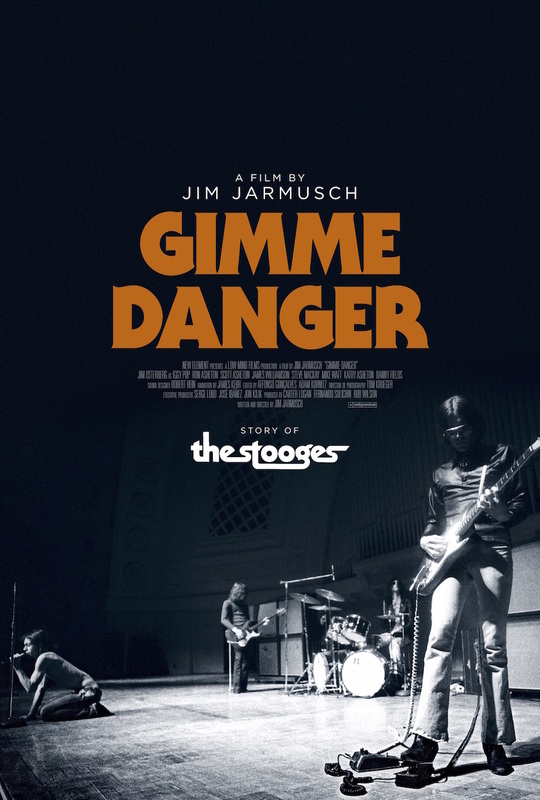 Having played the festival circuit and limited theatrical release, director Jim Jarmusch’s film Gimme Danger: The Story of the Stooges is now on DVD and demand. I know it’s hip to like Jarmusch, but the truth is I only like a few of the several films of his that I’ve seen. I suppose at times I found them too artsy-fartsy, sometimes boring. However, any trepidation I had going into the film was quickly vanquished when the story began to roll. The director masterfully lets the story tells itself and only uses his skills to cut it all together and present it in an absorbing and compelling way. The film begins with Iggy Pop telling his pre-Stooges background; most interestingly, his stint in Chicago where he drummed for a number of African-American blues and R&B players. This experience inspired Iggy to return to Ann Arbor, Michigan and start his own band and step out from behind the drum kit. Jarmusch adds some much appreciated historical context to 1960’s Ann Arbor. Probably not widely recognized as a hub of radical politics and music, Ann Arbor (and Detroit) was the midway point between San Francisco and New York, making it a thorough fare for the cutting edge of arts and (counter-) culture. Consequently, Iggy and the Stooges found themselves in a geographic area that not only inspired them, but also gave them a place to be discovered. Soon after the legendary MC5 took them under their wing, the two bands wind up signing to Elektra Records on the same day. The film goes on to tell the story of the Stooges recording their 1969 self-titled debut and 1970’s Funhouse, and the subsequent drug use that lead to the bands eventual demise following the recording of 1973’s Raw Power. The film then jumps to the wonderful story of the bands reunion, sparked by the film Velvet Goldmine, the Minutemen’s Mike Watt, and Dinosaur Jr.’s J. Mascis. However, the stories of 2007s The Weirdness and 2013s Ready to Die are not covered in much detail. The film closes on the bands 2010 induction to the Rock and Roll Hall of Fame. It was at this point in the film that I realized it was almost over. Indeed, the film is well paced and moves swiftly. There’s no section of the story that drags. In fact, I could’ve sat through another half-hour of the band members telling stories. However, Jarmusch is an accomplished filmmaker and obviously knows where to trim the fat when it’s needed to keep the films progress engaging. It makes sense for Jarmusch to helm this documentary, having previously utilized Mr. Pop as an actor in 1995s Dead Man and 2003s Coffee and Cigarettes, he treats his subject with respect rather than presenting their history through rose colored glasses. His style of filmmaking never takes over the films story. He uses vintage stock footage and some animation at times to bring some stories and anecdotes to life, but it’s never heavy-handed or cumbersome. Throughout the film the viewer is also reminded of just how far Iggy’s reach into pop culture and rock and roll has been felt. He was the first guy to wear a dog collar, stage dive, cut himself onstage, vomit onstage, and persistently buck the mainstream. Objectively, these are superficial footnotes to the impact of Iggy and the Stooges music. Nevertheless, they serve to remind us that Iggy Pop was an effortless taste-maker and true iconoclast. In the end, I was reminded of Heath Ledger’s line in The Dark Knight when he asks, “Do I look like a guy with a plan?” Iggy and the Stooges never had a plan, they were simply the Stooges. Other bands may have had better musicians or stronger singers, but none of them had the intangible quality of the Stooges. Gimme Danger pays tribute to the bands legacy and serves as an excellent document for understanding the origins of punk rock. Simply put, I loved every second of it.